December New In! - Cherry Colors - Cosmetics Heaven! I got all these items this month, some were purchased by myself, some were gifts and and some were awards or testers. Essence 24h hand protection balm in Strawberry Dark Chocolate - A lovely little gift I got from a friend (with the Duo nailpolish). Essence comes with these unique treats scents out yearly. Essence Happy Holidays nail polish in Run Run Rudolph - An interesting nail polish which you'll see in the following days on my blog. It is NOT red, but pinkish. 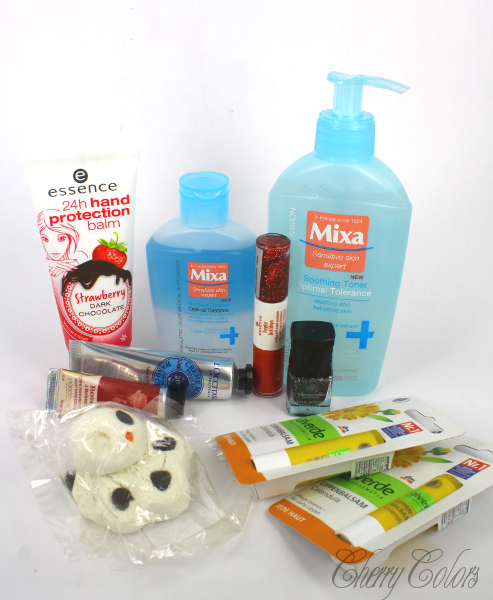 Mixa Toner & Mixa Make up remover - I got these because I 'tested' them from my sister. I loved them so much that I decided to buy them for myself. Especially since I had a toner I hated. Blah! Alessandro Glitter Stars Shooting Star nail polish - The last thing I probably need right now is more polish (but who does say I don't WANT any?!). I won it from the Alessandro Slovenija facebook page. It is perfect for the New Year's Eve. L'Occitane 20% Shea butter hand cream - I remember loving it many years ago. I also remember it helped with dry hands a lot. So I caved in and got it for myself. It does help a lot! L'Occitane Rose hand cream - Got it as a freebie with my purchase. L'Occitane Almond shower oil (not pictured) - God, I love this scent. I could bathe in it all day long and wouldn't get bored of it. I also recognize it anywhere. Lush Snowman bath melt - Got one for my mom and kept the second one. It smelled a lot like Coca cola when used up in the bath. And you see all the chocolate chips? It melted in tiny pieces and messed up my bath tub when it cooled down. Alverde lip balm calendula - My staple lip balm. Doesn't smell all that good, but it does one heck of a job at lip repairing.